‘Pulpy Kidney’ or ‘Bloednier’ is not a diagnosis but describes the result of accelerated post mortal autolysis. The toxin producing bacteria Clostridium perfrigens Type D (Cl. perf D) can also be isolated from the gut of normal goats. These bacteria just require a faster nutrient passage or diet change to trigger a bacterial overgrowth and excessive toxin production. We should be referring to the clostridial disease as ENTEROTOXEAMIA. Enterotoxeamia in Angora goats usually has some predisposing factor with young goats in good condition being most susceptible. The interval between predisposing factor and disease may be 2-14 days (usually 7-14). Ruminal flora adapt to a diet over several days. When a feed is changed to one with a high starch content the flora has not adapted to some of the starch which would normally be converted to fatty acids in the rumen. This carbohydrate then passes into the intestine where it results in the proliferation of Clostridium perfringens type D and production of toxins including epsilon toxin. The epsilon toxin is activated by trypsin in the small intestine which increases the toxicity by thousand-fold. The toxin causes an increase in the permeability of capillaries. 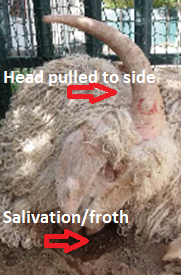 Goats are usually found dead often without clinical signs or with head arched backwards and froth (bloody) may be present at the mouth and nostrils. The carcases may bloat more rapidly than expected. (iii) Chronic syndrome which may last a few days characterised by diarrhoea and weight loss. Goats which have previously been vaccinated against Pulpy may develop the neurological signs and die as seen in the goat ram in the video below. Note the twitching tail, short choppy staggering hind-quarter and collapse. As goats usually die acutely treatment is not possible. Treating goats with long acting tetracyclines in the interval between vaccination and immunity may help. The response to revaccination is rapid. If deaths occur following a change in diet such as moving to a new camp return the goats to the old camp or remove the concentrate feed and feed long stem dry food such as lucern hay. For these vaccines to be effective a SECOND VACCINE MUST be given 4-6 weeks later and the ewes their BOOSTERS 4-6 weeks before kidding to ensure colostrum cover for the kids or at least 2 weeks before exposing the goats to a predisposing factor. Angora goat farmers use different clostridial vaccines depending on the intensive/extensive farming conditions. Pulpy Kidney (Pulpyvax) at 3 months old with a second vaccination 4-6 weeks later then annual boosters. Enterotoxeamia Vaccine (OBP) at 4-5 months (oil-emulsion).If earlier than 4 months then 3rd vacs after 6 months. 2nd vac 4-6 weeks after 1st (Alum Precipitated) then annually. Adapt goats to change in diet. For example if moving goats from the veld onto Lucerne lands then start feeding some dry Lucerne while they in the veld and moving them onto old lands first with some bales around the edges. Why is diagnosing ‘Pulpy Kidney’ ‘Bloednier’ so difficult on Post Mortem ? 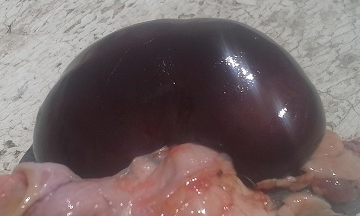 To confirm ‘Pulpy Kidney’ (Clostridium perfringens D) is very difficult because some of the Post Mortem (PM) changes are found in many other diseases. 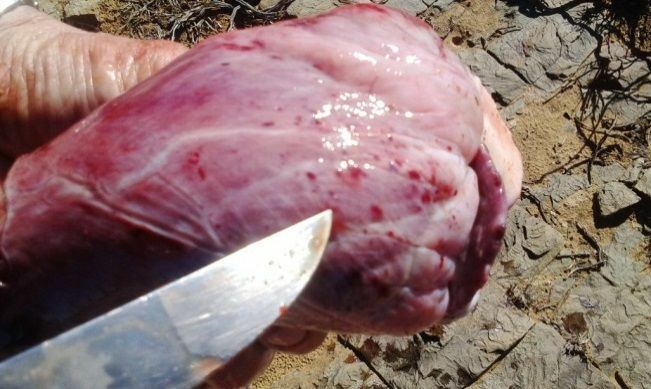 Farmers may sometimes suggest the sheep or goats have died of ‘Pulpy Kidney’ and think the vaccine is not working. To suggest a vaccine is not effective would require a combination of clinical signs, post mortem findings, and intestinal smears, histopathology samples of intestine, detection of Clostridium perf Type D as well as the important histopathology lesions of the brain due to the difficulty to confirm the diease condition. The pathology changes we see on PM associated with Cl. Perfringens D are the result of endothelial damage caused by the epsilon toxin. Lesions are NOT constant and may be absent in some. 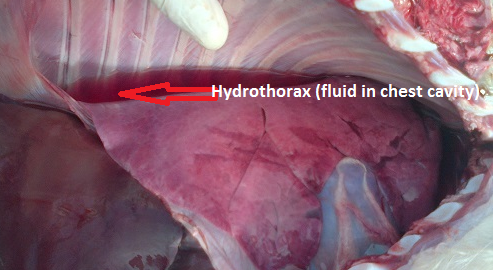 Haemorrhages in sub cutaneous tissue of the neck and shoulders, muscles of abdomen and diaphragm. What is the best sample to take to diagnose Clostridium perf Type D? 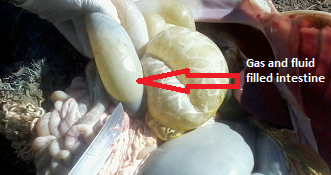 Brain: perivascular proteinaceous oedema. (rarely cases where this does not occur).